We’re excited to launch the final of our three research reports from DataShift in each of our pilot locations. 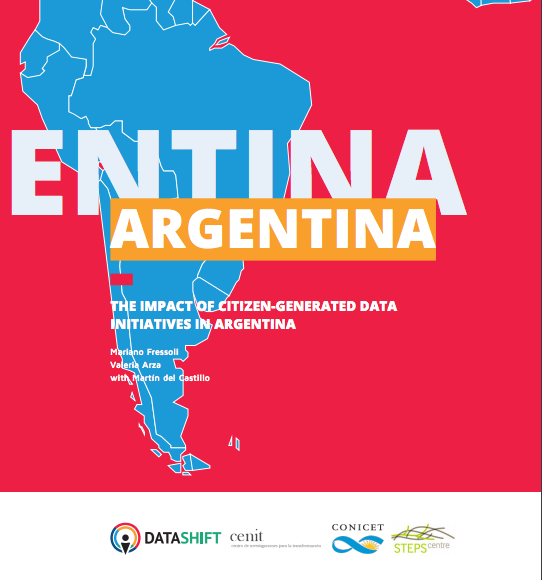 We wanted to know more about how data generated by citizens is being used in Argentina. Citizen-generated data initiatives in Argentina have increased the visibility of violence against minorities, land-grabs and environmental threats – issues that are often ignored by the mainstream media. Communities who submitted data from their area or learned how to collect it felt empowered by the experience, while others found that submitting data helped them recognise that their issues are part of a wider national or international issue. Although one government agency was incorporating data from an initiative in its decision-making, most institutions are yet to accept and use citizen-generated data in a systematic way. The Matanza-Riachuelo Basin Authority (ACUMAR) includes and responds to data submitted to QPR about river clean-up operations, but other initiatives experienced much more limited government responses. Citizen-generated data initiatives may help to initiate a dialogue process, but organisations will probably need to complement this with other forms of mobilisation to bring about broader changes. Initiatives generally lacked detailed procedures to validate information submitted by citizens. Data was usually checked in a manual, ad hoc way rather than through systematised verification procedures (by contrast, eBird uses semi-autonomous filtering systems and expert-supervised validation mechanisms). Three of the four initiatives were unable to collect large quantities of data because participation rates were too low (potentially because the initiatives were new and were still trying to reach new audiences). Starting a citizen-driven data initiative is likely to become easier in future because of decreasing technology costs, and growing recognition of the importance of open data and need for data that addresses sustainable development issues. Initiatives typically had relatively low running costs and theoretically could be replicated elsewhere: for instance, eBird relies on hundreds of volunteers to gather data, but is managed by only 4 employees and 20 expert advisers working ad honorem. Most initiatives depended entirely on short-term, project-by-project funds, and lacked detailed plans to expand nationally or internationally. Only one of the four had long-term funding. Citizen-generated data initiatives are often introducing practices and technologies for the first time, and will have to work hard to sustain their work and negotiate standards with reluctant institutions. This report and our other research can be found in our Research section under the Learning Zone.